Being a black student on a predominantly white campus isn’t always easy. Especially when some of your white classmates repeatedly post racist comments on a popular social media app used by college students. Such is the case at American University. Members of a student-led, racial-justice community organization called the Darkening launched #TheRealAU campaign so that students could share their experience with racism on campus, something the organization says the university’s president, Neil Kerwin, has failed to address aside from a memorandum written in April. However, black students on campus say that racist messages are being left on the popular Yik Yak app and that although they’ve complained to the president about it, nothing has been done. As a result, the students decided to take action. 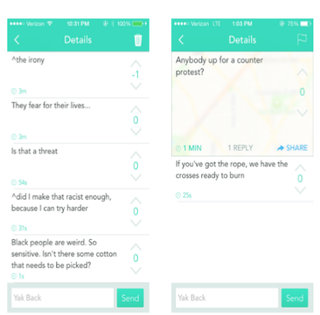 On Oct. 8 the students posted screenshots of the racist messages all around campus in hopes of drawing attention to the ongoing issue. But eventually the images were taken down by campus security. The black students on campus want their voices heard. Some may suggest that they ignore the app because only cowards would use it to post anonymous messages. But black students on campus shouldn’t have to be on guard and subjected to cowardly acts of racism—offline or on social media.